There's bad ads and then there's this bus advertisement from Airbnb. The tone of it seems, well off and condescending and initially we thought it was a hoax. Turns out, not so much. 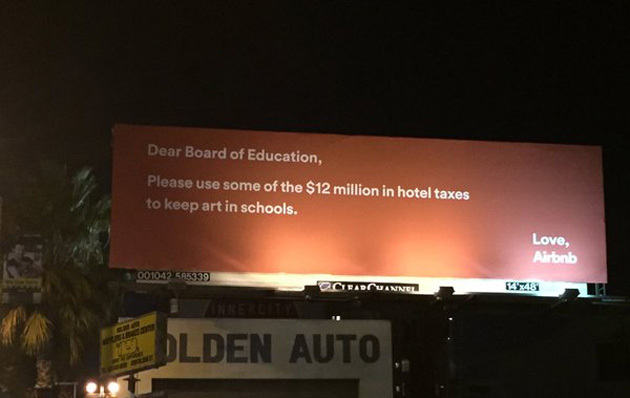 After contacting the shared-rental service about the ad, Airbnb spokesperson Christopher Nulty sent Engadget the following statement: "The intent was to show the hotel tax contribution from our hosts and guests, which is roughly $1 million per month. It was the wrong tone and we apologize to anyone who was offended. These ads are being taken down immediately." The photo was posted to Facebook and quickly spread to Twitter where it's been condemned by librarians and the public at large. It's not just the libraries being targeted by the campaign. There was also an ad for the public works department. San Francisco is in the midst of a debate about how to regulate Airbnb and other rental sites with a proposition on the ballot that's been the target of a well funded "No on F" campaign. Some residents are concerned that the service's hosts are keeping housing units off the market in a city where rents have sky rocketed and availability of rentals has shrunk dramatically in recent years due to the influx of technology workers.